Sitting in a rollercoaster is quite a scary experience for many people because it makes them dizzy especially if they have a fear of heights. 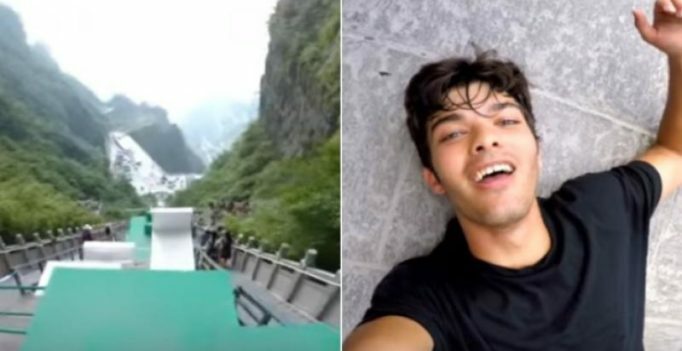 A man in China recently jumped, hopped and dived through various obstacles to conquer the largest parkour course and people cannot believe it because he did it flawlessly and the dizzy video is now going viral. According to a media report, Adventurous youtuber Calen Chan jumped through various obstacles on the largest parkour in the world at Skyladder course in China. The 19-year-old athlete made his way with ease on the Tianman Mountain and his perfect jumps and slides made the experience even more thrilling. Just when you think he has reached the end, he makes his way again through high and low obstacles keeping all the viewers adrenaline pumping too. The exciting video was published by Calen on Youtube and has got over 1.5 lakh views as people are taken through the dizzy jump with a camera fitted on him. The course has a 45 degree incline and is as far as 999 steps to the bottom.